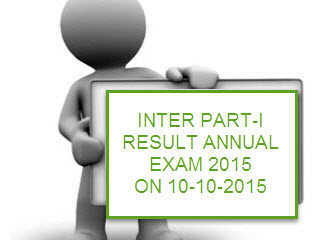 The Inter Part I Annual 2015 Examination Result will be declared on 10-Oct-2015 at 10:20 A.M. The Students who have appearing in Intermediate Part-I Annual Examination 2015 can get their result on official website of Board of Intermediate & Secondary Education, Gujranwala (bisegrw.com) and on my page comment (fb.com/gaintech4it) on right day and time. The requests of before time result asking are belonged to corruption and you should not ask about corruption to me please. It is my humbly requested keep avoid from corruption. How to choose study program?